I was reading through some old saved emails and ran across one that one of you out there sent me. It was called "Colors of Me". I answered some questions and this is what came up about me when I was done. I'm doing this to see if this helps you get to know me better,...... I'm not so sure it is 100% right, but you be the judge. My "color" is medium orchid. Here goes: My dominant hues are red and blue. I am confident and like showing people new ideas. I play well with others and can be very influential if I want to be. My saturation level is medium - I'm not the most decisive go-getter, but I can get a job done when it is required of me. I don't think the world can change for me and I don't want to spend too much effort trying to force it. My outlook on life is brighter than most people's. I like the idea of influencing things for the better and find hope in situations where others might give up. I'm not exactly a bouncy beam of sunshine but things in my world generally look up. The flowers to the right aren't orchids, but I thought they were pretty! 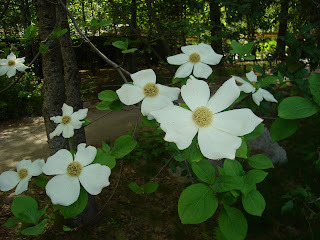 They were actually some trees in bloom in Yosemiti National Park I took in May when we went to San Francisco.